To read this entire message and see the Brigade poster, click on the link below. A great barbershop event comes to Reno on the last weekend of August at the Peppermill Casino. 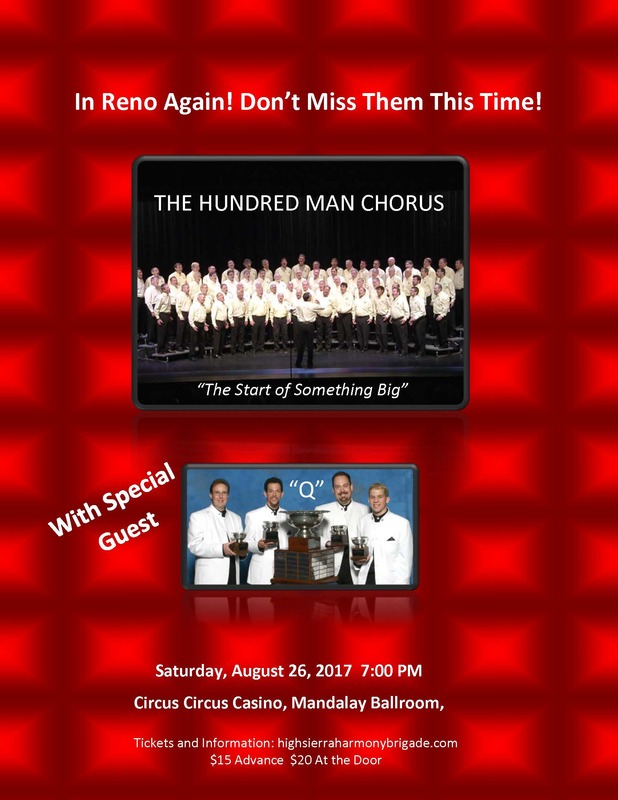 The High Sierra Harmony Brigade features quartet competitions and a magical show of the 100 Man Chorus which includes several Reno singers. Behind the scenes, 100 barbershop quartet enthusiasts from all over the western United States (and beyond) come to compete in 25 randomly assigned quartets. On Saturday night, those 25 quartets form the “100 man chorus” for a public performance. Come to the show on Saturday night at 7:00 PM with your friends and family to show them great barbershop singing.